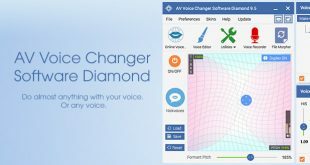 AV Voice Changer Software Diamond 9 (VCSD 9) is one of the most effective voice changer that effortlessly manipulate your voice/audio files, in both online and offline purposes. 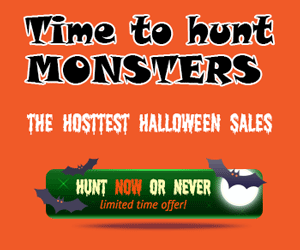 But, imagine what you would do if you made just a small mistake in a long recording? Would you start all over again? 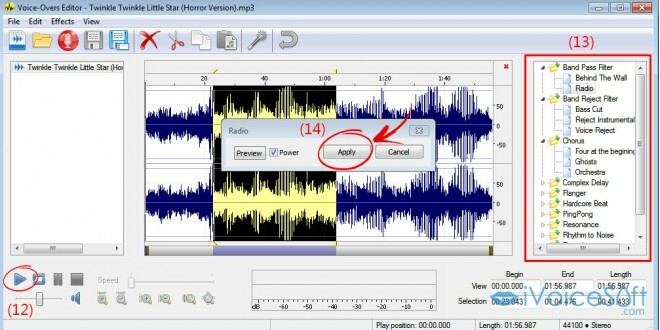 Or you you download an audio editor to cut the false part out? Well, it’s not that complicated! 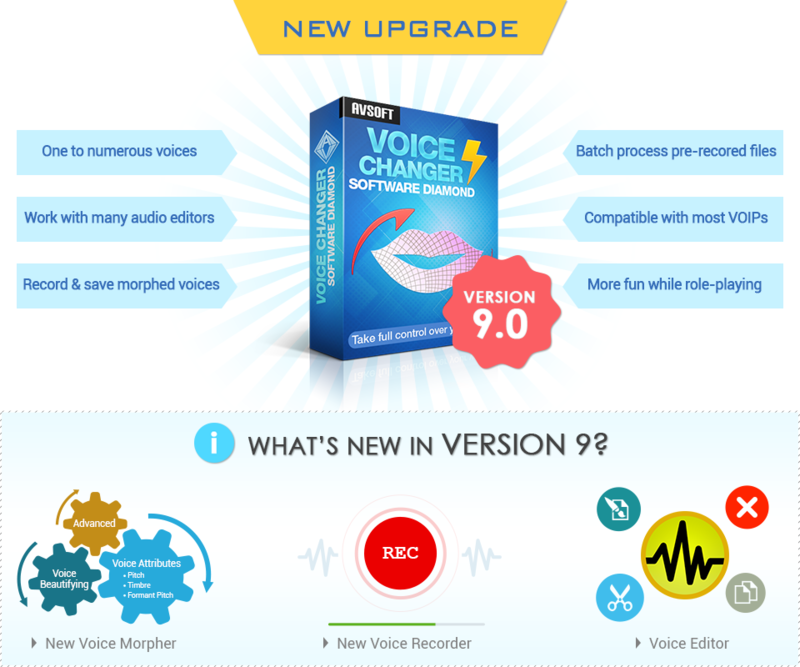 This voice changer software now includes a useful Voice Editor in case your need this kind of assistance. 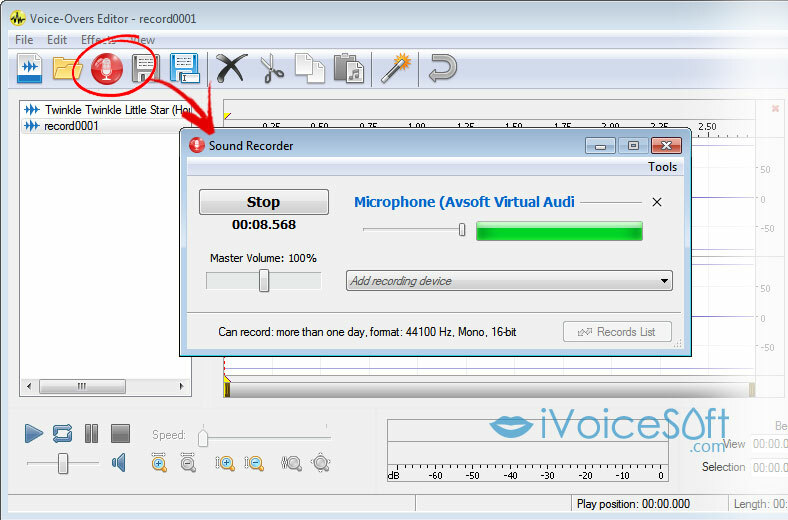 This tutorial will show you how to use Voice Editor of VCSD9 to edit your audio file easily. 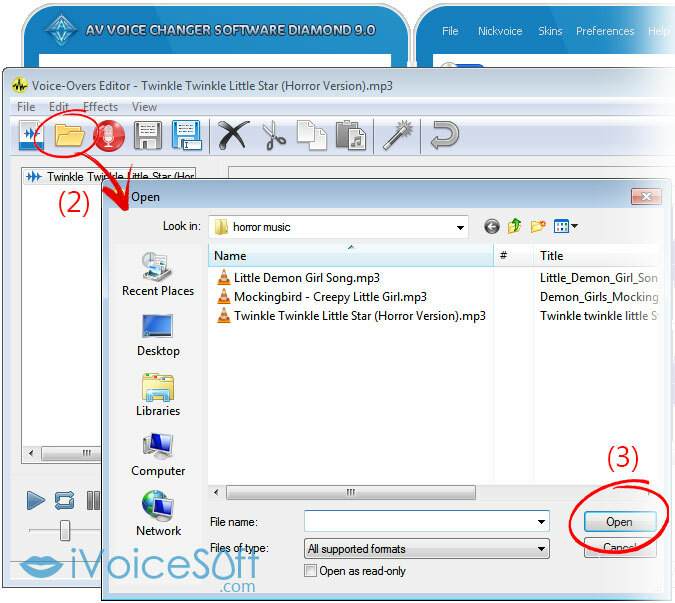 On the main panel, click on Voice-Overs Editor icon (1) to open Voice Editor window. 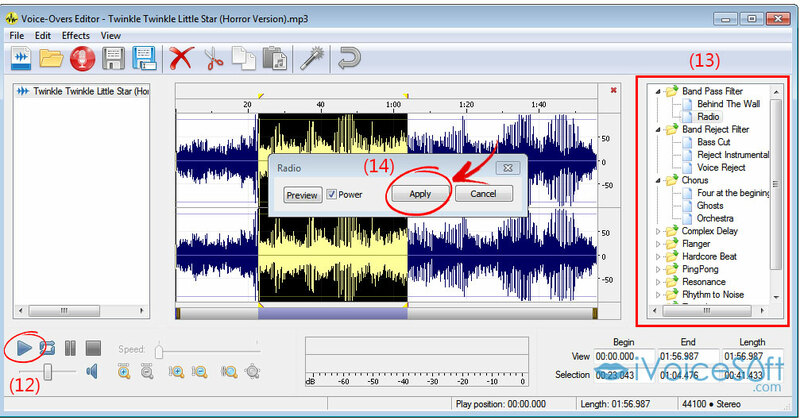 You now can do basic editing tasks like Delete (6), Cut (7), Copy (8), Paste (9), Apply selected effects (10), Undo (11). Click Play (12) to listen to how your file sounds. 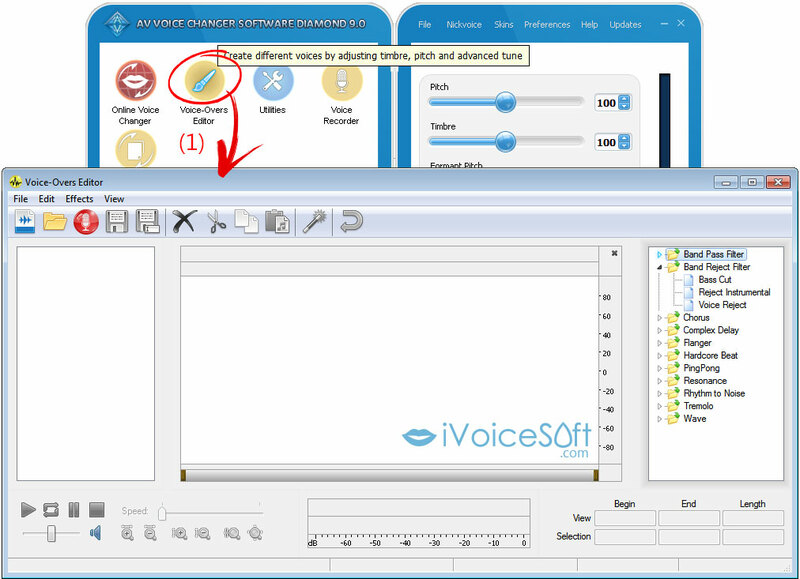 On the right side of Voice Editor panel, you can find a rich list of special built-in voice effects (13) for instant use. 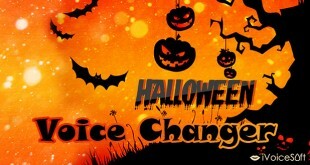 Once you click on an effect, you can hear the change immediately through headphones. There will be also a dialog box to confirm this change, click Apply (14) to make this adjustment. 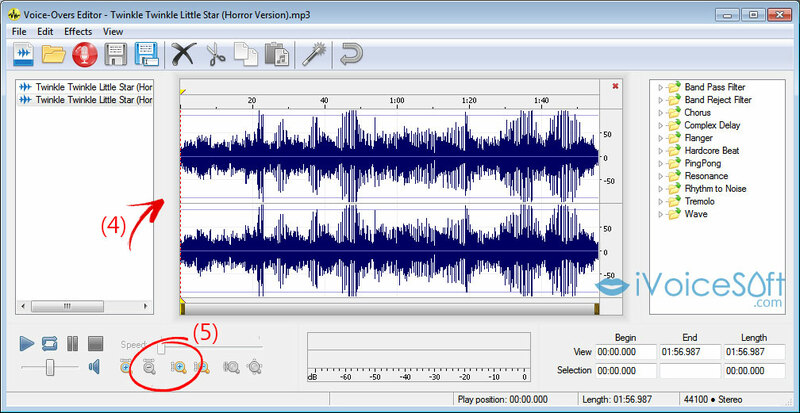 If you are satisfied with the audio output, click Save File as… to save your final result. 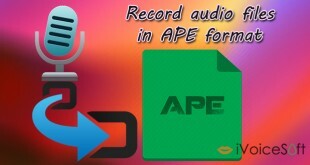 BONUS: You can add your voice to audio file by recording. 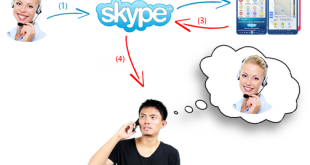 Follow below picture to do voice-over by yourself.